Many thanks to the 90 readers who sent photos of city life and car-free transportation with children, and also to the 639 of you who voted. We are happy to announce the two winners of a free Breezer bike. This picture of Dave Cowan’s daughter, Isabelle, ran away with 259 votes — an impressive 41 percent of the total. Dave’s friend Danielle Anderson took the picture, but the credit for Isabelle’s precocious riding skills goes to Dave, a Safe Routes to School advocate in Denver, Colorado. He says Isabelle started riding at a young age on the back his Surly Big Dummy longtail, and then on a bakfiets when her little sister was born. In fact, Dave and his wife, Sarah — who doesn’t even consider herself a bicyclist — biked Isabelle to daycare and then to the hospital to deliver Isabelle’s sister, since it happened to be Bike to School Day! As for Isabelle, she moved to a strider at two years old and now at almost four she can ride her own pedal bike sans training wheels, Dave boasts. She just learned about a month ago, and she’s getting into practicing on different surfaces — hence the concentration when facing that puddle! Doug Gordon of Brooklyn Spoke is our second winner. 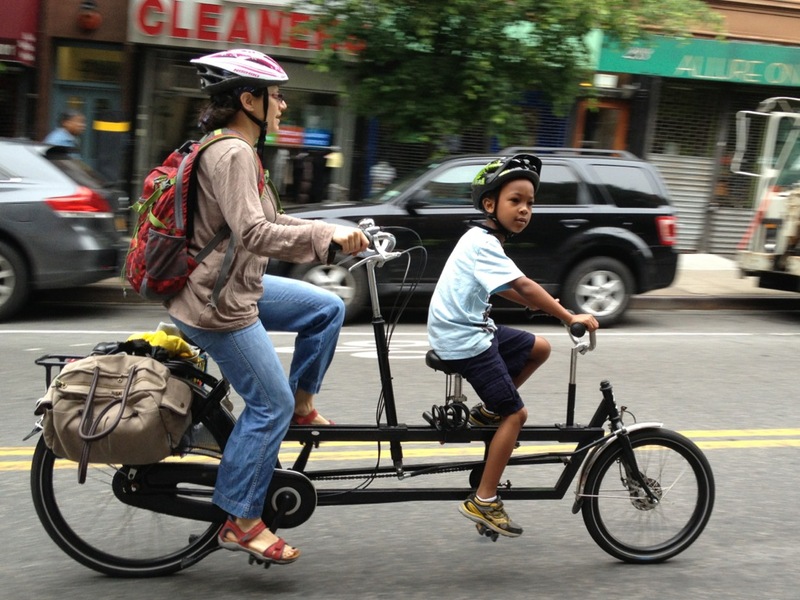 His photo of a woman and child riding an Onderwater tandem to school in Park Slope got 165 votes, for 26 percent of the total. Doug says he sees this pair riding almost every morning on Fifth Avenue when he’s dropping his own 3-year-old daughter off at school. On the morning he snapped this picture, Doug’s daughter saw the bike first and yelled out, “Papa, look at that bike! It’s like Amsterdam!” If only all U.S. toddlers knew the ins and outs of Dutch bicycle varieties — she’s still talking about all the different kinds of bikes they saw on a family trip to the Netherlands last year. Congratulations to Doug and Dave! They’ll each get this Downtown EX bicycle from Breezer for their fantastic submissions. The first picture looks like a typical suburban street–grassy lawns, gently sloping curbs, no sidewalks, etc. Whether it’s technically within city limits is immaterial. I guess my point is that if either of these two pictures is to be circulated more broadly to promote the idea of kids living a healthy, urban lifestyle, the second of the two is much more powerful. That first picture might be very urban. I’ve seen similar sights in San Francisco’s Golden Gate Park on a car-free Sunday not long after watering the grass. Dave’s friend Danielle Anderson took the picture, but the credit for Isabelle’s precocious riding skills goes to Dave, a Safe Routes to School advocate in Denver, Colorado. So this picture may have been taken in a Denver, CO area park. Yep, it’s from Washington Park in Denver — a city lucky enough to have such good green spaces you can forget you’re in a city. I don’t know many parents who would let an almost-four year old ride a pedal bike independently down a suburban street. I was sure it’s a park when I first saw this image. Right, but the point is that the other one is a more vivid image of life in the city with a child on a bike, even if the former happens to actually be more urban. I think the contest voters chose the images superbly. Both are vividly urban. The second image has the obvious artificiality of a city street. The first image has the surreal, pseudo-wildness of a city park. Yes, there is all that open space and greenery. But various cues – grassy monoculture, possibly non-native trees, streetlight, non-rural shoulder, etc. – set off my alarm bells and grab my attention more effectively than the street scene does. I can just dismiss the second picture with a toss into the “Typical City Street (Neat Bike)” pigeonhole. But the first picture defies any attempt to toss towards “Country / Suburban Road w/ Cute Kid”. Why ? Because of all the clues that say that the scene is NOT that of a country / suburban road. That subtle jarring that occurs when the camouflage doesn’t fit (e.g. jungle camo in a temperate forest). De gustibus non est disputandum. Have to say i disagree. pic 1 appears to be a VERY suburban to me. what you describe as a non-rural shoulder is very suburban. i grew up in suburban nj with a lot of street curbs (actually just piled black-top) and no sidewalk. the lack of sidewalk is also a noticeable cue that it is not an urban setting. the streetlight you mention also appears to be the housing that sits atop underground cable tv wiring – a very suburban cue in my opinion. finally, and most the most powerful cue to me is the lack of buildings in the image. the building setback from this street must be ginourmas by urban standards. denver is NOT more urban that brooklyn period. Try a Google Streetview of the intersection of Transverse Dr. and Middle Dr. West in San Francisco, CA. That’s in Golden Gate Park and the view to the SW shows a trail with a curb cut like the one in the first picture. Olmsted and his colleagues left us a great set of templates for urban parks with practical examples. P.S. If you’re looking for the Lantern Waste you’ll have to start with “The Magician’s Nephew“. There are several kinds of roads – perimeter mains (S. Downing St., E. Virginia Ave., S. Franklin St., and E. Louisiana Ave.), a corner bulge (SE – Franklin / Arizona / Gilpin / Louis. ), a transverse connector linking E. Exposition and E. Mississippi Aves., and an inside-the-park loop around the lakes and the central green space. P.S. SF’s GGP also has perimeter mains : Great Hwy., Fulton St., Stanyan St., Frederick St., and Lincoln Way. They define a rough box for a cat’s cradle of park roads and trails. If the goal of the photograph is to instantly convey “happy kids in cities,” I have to agree with those who say the picture of the kid in the park fails. Now, you can point out all the city parks around the nation that look like this, but when people look at this, their first thought will always be suburb. The kid in the photo is very cute, and it’s a great picture, but it fails to capture the message. 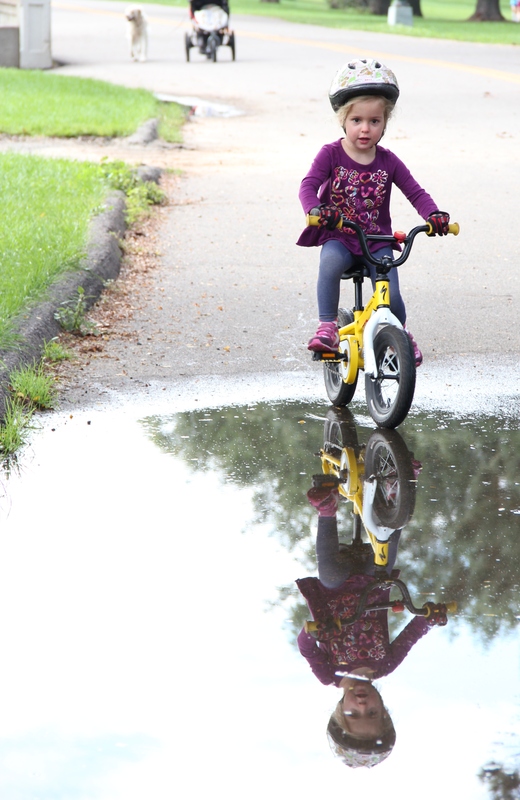 So winning picture in a kids + citties contests is not a kid-in-a-city-on-bike, 2nd photos is. You Won’t Soon Forget These Photos of Ghost Bikes. That’s Exactly the Point.